This is the third week of ‘Skin Facts’ and last week, we’ve looked into the sun protection function of children vs adult skin, and how the sun affects eczema skin. Today, we’re looking into another critical function of skin and one that is very relevant for eczema skin – our skin’s moisture retention property. One can also view it as how much moisture is lost from our skin, known as Transepidermal Water Loss (TEWL). TEWL is studied by dermatologists, as excessive TEWL points to a defective skin barrier, and in severe cases, affect the ability of the body to function. Let’s go “water deep” into this skin function! Our skin allows water to be lost through it, as part of insensible perspiration (or transepidermal diffusion) and sweating. Insensible refers to us not being aware of it (another insensible loss of water is from respiration). Sweating helps regulate our body temperature, via cooling of the skin. However, sufficient intake of water is required in order for sweating to not dehydrate the body and continue to be effective in cooling our body temperature. Much of the water is lost through the stratum corneum, the upper most layer of the epidermis made up of a dead cell layer. A defective stratum corneum layer will allow excessive epidermal water loss and potentially, increase risk of irritant and allergen sensitivity. Water loss from evaporation from our skin is about 400ml daily in an adult. For research news on how the skin can be a channel for allergy, see Food Sensitization from Eczema. TEWL from baby skin is higher than normal adult skin, due to their thinner stratum corneum. For premature infants less than 30 weeks, there are also fewer layers of stratum corneum resulting in increase fluid and heat loss. Interestingly, infant skin is found to have higher water content and able to absorb more water but lose excess water faster than adult skin. TEWL was also strongly predictive of AD at 12 months (study here). The natural moisturizing factor (protein breakdown products such as small amino acids, urea, pyrrolidone carboxylic acid, ornithine, citrulline, urocanic acid) in infant is also lower than an adult. Reduced bathing – Washing baby skin with a washcloth during the first 4 weeks of life is associated with increased TEWL and decreased stratum corneum hydration compared with simply soaking in water. The recommendation is to use a mild liquid cleanser with water (less drying than water alone), and that bathing should be brief (10 minutes or less) and no more than every other day with spot cleaning in between. Good skincare regimen – Moisturizing protects the skin barrier (see video). It is important to note that given the thinner stratum corneum of infants, their higher surface area to body ratio, infants are more vulnerable to toxicity of products. Therefore, be sure you understand the product label (there’s a comprehensive Sensitive Skin Products blog series to help you with that). TEWL is studied to be higher in eczema skin and also dry skin (without eczema). The water content of stratum corneum is also lower in adults with eczema than normal skin. It is also studied at the natural moisturizing factor of eczema skin is defective, lacking in proteins that are able to play a role in the skin’s humectant property – the ability to pull moisture from the environment and retain this water (which is why 2nd generation moisturizers incorporated humectant property, learn more here). To round-up, we learnt that water is integral to our body and to our skin. 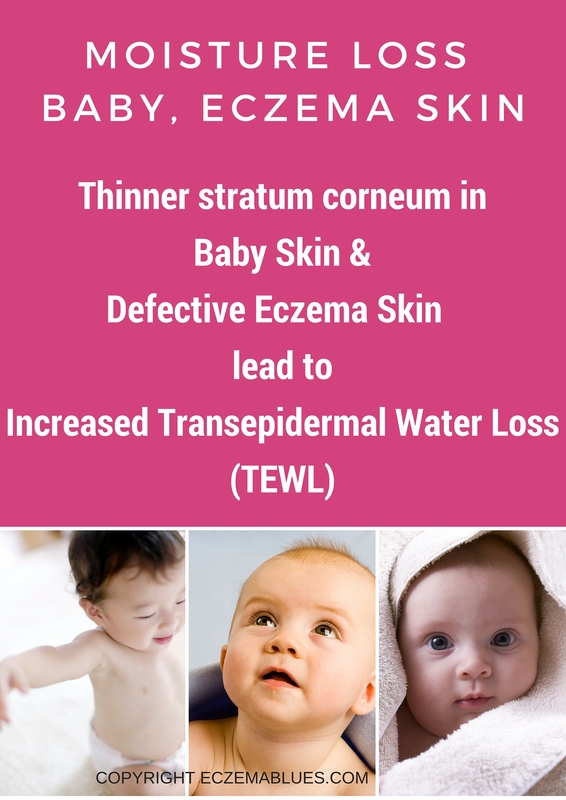 We have insensible water loss and a thinner stratum corneum in baby skin and a defective stratum corneum in eczema skin both results in increased transepidermal water loss (TEWL). This knowledge should encourage (not discourage!) us to be more committed to a good bath and skincare routine.